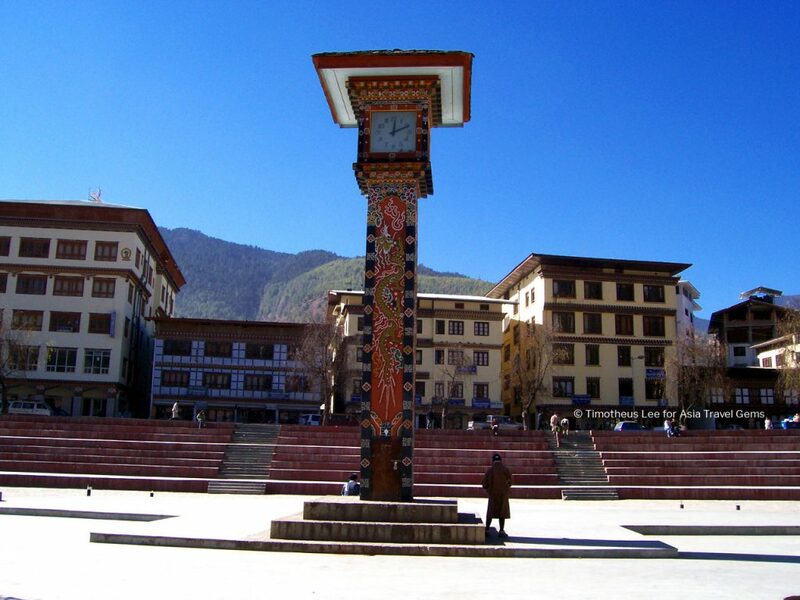 One of the many Best Places To Visit In Thimphu Bhutan is the famous landmark that is the Clock Tower Square situated at the heart of the city, Thimphu, Bhutan. It is a popular venue for important events such as cultural festivals, sports events, concerts, fund-raising events, movie award ceremonies, trade fairs, live musical shows, and even once hosted the Indo-Bhutan Friendship Car Rally. 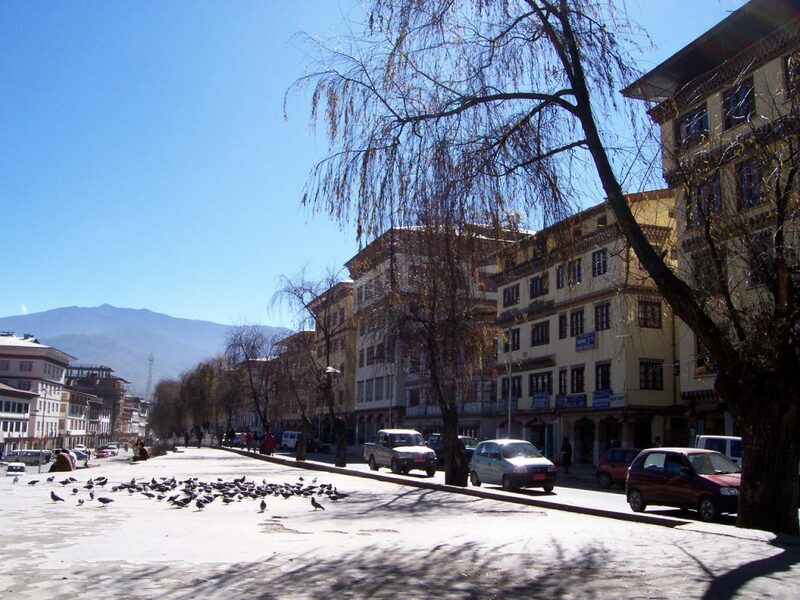 It is located just below Norzin Lam, which is sort of like the main street of Thimphu. And of course, one of the Things To Do in Bhutan is to see the famous Clock Tower. Why is it famous? Well, it is very beautiful, and it is the first clock tower ever built in Bhutan. * Interesting Fact – The Clock Tower has four faces, each displaying a different time. When I first noticed that I thought they may be showing different times at different locations. Sadly, a close friend who worked there, and whom I visited and stayed with, informed me that they were just not well maintained. The same friend added that the clock tower was the first ever built in Bhutan. Some time back she was dug out and temporarily stored away while the area was renovated into a square. After the renovations were done, she was placed back at the center of the square. The Clock Tower is very beautiful, and covered with intricate designs of traditional Bhutanese architecture. Rich Bhutanese carvings and paintings , traditionally hand crafted, showing images of flowers and gold painted dragons decorate the four sides of the Clock Tower. The dragons are symbolic, representing Bhutan as an independent dragon kingdom with the name – Land of The Thunder Dragon. 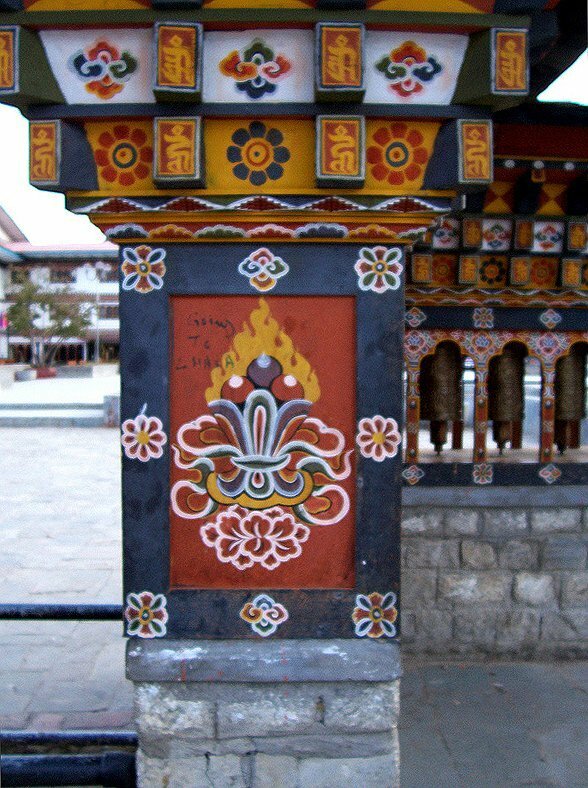 Around the square, there are Traditional Bhutanese Mani Lhalhor (Prayer Wheels) that are extraordinarily pretty to look at. They are in the same Clock Tower Square, and feel free to spin the prayer wheels. Spinning prayer wheels is a common practice in Bhutan, you can almost say it is a Bhutanese way of life. 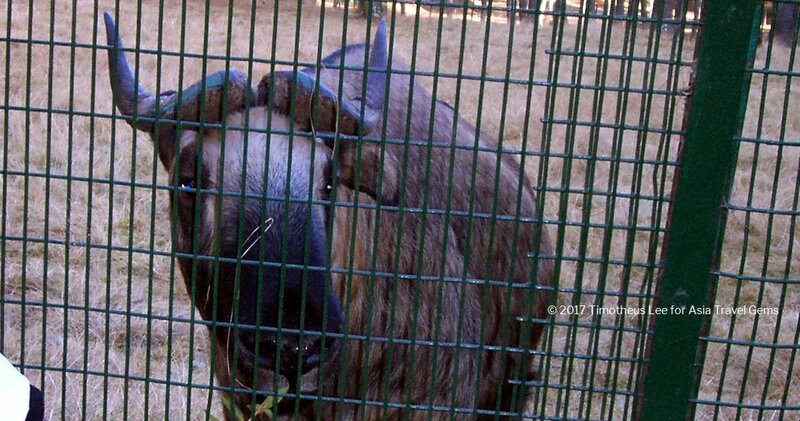 They are seen almost everywhere in the country. The belief is that when a person spins or turns the wheels, they alleviate bad karma, and gain wisdom and merit. Some also believe that by turning the wheels, good luck is received. The prayer wheels here are made of metal. And it can also be made from wood, stone, leather or even coarse cotton. In the picture above, the wheels are crafted with the Buddhist mantra – Om Mani Padme Hum. It is in the Sanskrit language, and cannot be easily translated into an English phrase. It is believed that when a person speaks or chants this mantra, the person will receive many blessings. 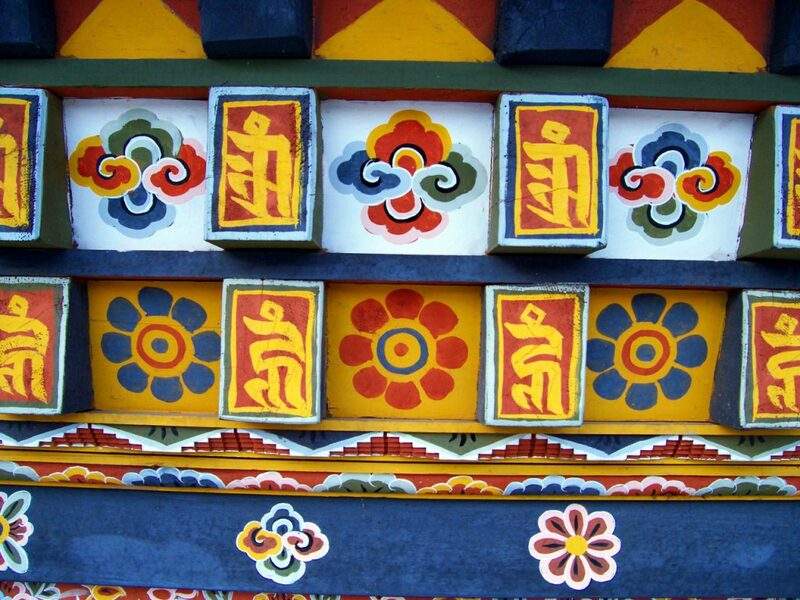 The prayer wheel structure is exquisitely decorated with traditional Bhutanese paintings and motifs. A real credit to the Bhutanese on how much effort and detail they place in this display. Don’t you agree (see both images below)? When you have toured the city of Thimphu for few hours, and need a place to rest, this is an ideal location for that. There are many benches around the square for people to sit, relax and enjoy the view. Also, around the square, one can find shops, restaurants, supermarkets, and hotels in quaint three-storey buildings that are designed with a blend of fine traditional and modern Bhutanese architecture. They have multi-colored wood frontages, small arched windows and sloping roofs. One of the properties that caught my eye was the Druk Hotel that is at this location. It looks luxurious, or as luxurious as can be in Bhutan. I heard from my friend who worked in Bhutan that this is quite a good hotel. Perhaps next time I will stay there? 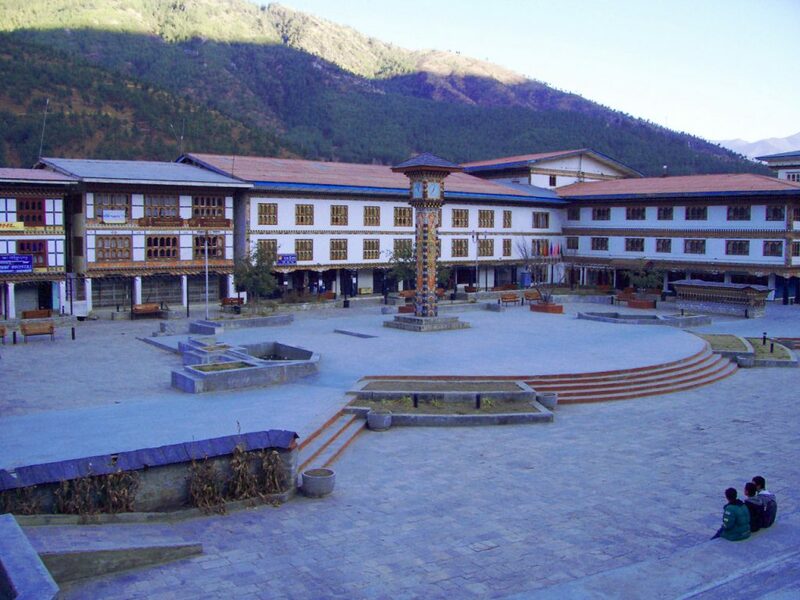 If you have ANY questions about this article, about Best Places To Visit In Thimphu Bhutan – Clock Tower Square, ANY at all, please submit your questions as comments below. I will be happy to help you out. very beautiful, i would love to visit this place, i love traveling and learn about all cultures, see the amazing things every country has, and this is one of them for sure, thank you for sharing. 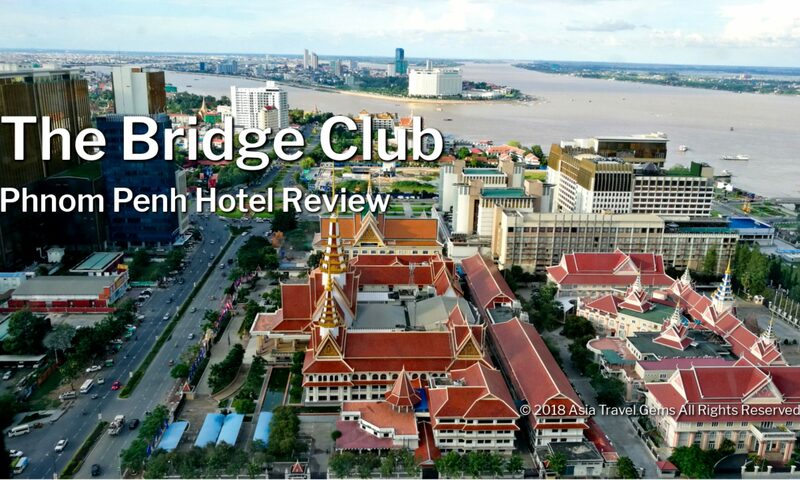 we need to always promote these places because not every travel agency do it. Thanks for reaching out Coralee. Your query is about Digital Marketing and we have a site to recommend where you can get the info you need. It is a site by SEO & Digital Marketing Consultant in Singapore – https://timotheuslee.com. Do visit soon. We heard he’ll be posting articles about web design and development soon. 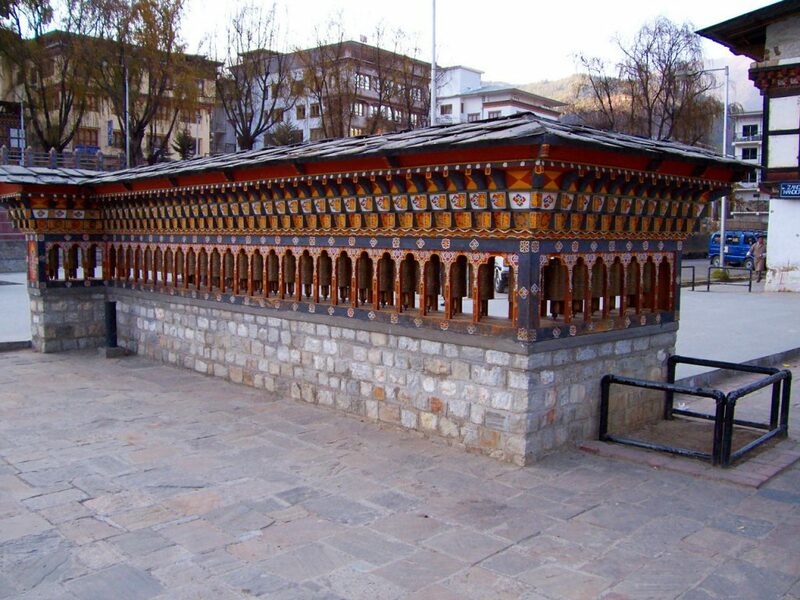 This is an excellent review of Thimphu Bhutan. The traditional ways and the events hosted in Bhutan really peaked my interest. The prayer wheels sounds like something that is unique to Bhutan, are they? If I could travel the world I would visit Bhutan. Thanks for sharing. Thanks Maurice! Glad you like it! The prayer wheels are popular in the part of the world where Bhutan is. So nearby countries also have them. Yes, you must visit Bhutan one day. It is truly paradise on earth. I love your blog and thank you so much for writing it! It is so filled with great innofmatior! I am just getting started along this journey here in Australia and have found your writings to be so helpful. I hope you write a book. There is so much information on the blog and I’m working my way through it but having it all organized in a book would be great! Thanks Butch! Your comments have made my day. I’m so happy! Glad you found the info useful. I’ll be adding more articles and cities soon. Pls sign up for our newsletter to be updated. And yes! Would love to publish all this in a book. Know of any good publisher? I am actually in Asia and definitely will go to first clock tower in Bhutan. Thanks for great writing. Very beautiful tower clock you have there. Fun fact you gave us, I also expected that the hours were of different places. 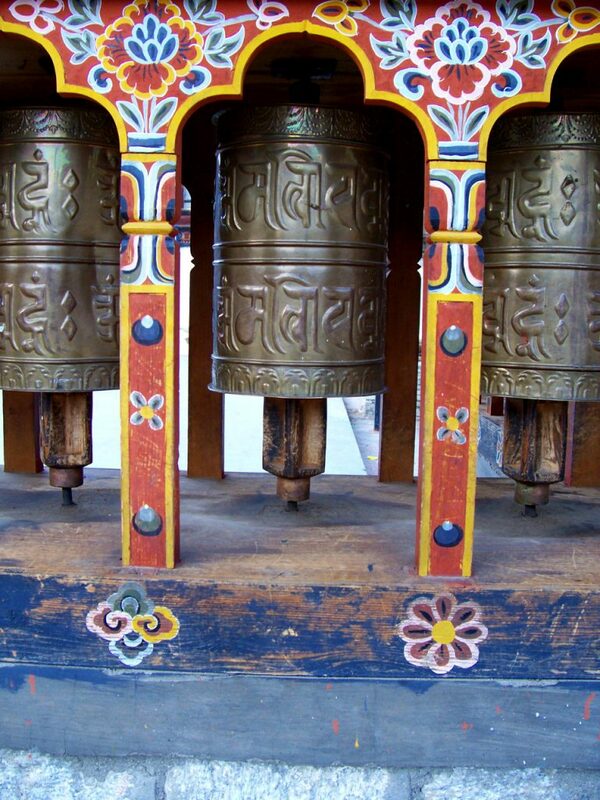 I like the concept of the spinning prayer wheels. if I ever stop by I’ll make sure to give them a spin for good luck. Does the square become crowded at times, or is it more of a tranquil place? Hi Luis! Thanks for dropping by. Glad you like the article. Watch for more as I post more travels. I love the Prayer Wheels too! The Square is usually quiet, especially during the day. Friday nights, it does get a little crowded as the monks get off day and they are everywhere. The Square is mostly crowded during major events. Thanks again for your kind comments. Do visit again soon. This sounds like a great place to visit. I love to travel and exeperience all the wonders each culture has to offer. I have not been able to travel as much while working to complete school but look forward to starting again soon. The clock tower looks very interesting as well as the prayer wheels. I would love to know as I am a foodie about great places to eat in these unique places. Great post and thanks for sharing about this unique place. Hi Mario! Thanks for dropping by. This is the 1st post about Bhutan. I have a few more places to share, and one or two food places to enjoy there. Do visit soon to see the updates. Thanks for your very thorough review on Bhutan. There are so many interesting things to do and explore there. I have always been fascinated with the different cultures around the world and would love to visit Bhutan one of these days. Beautiful pictures, thank you for sharing. Thanks for visiting Asia Travel Gems, Jerome! The clock tower and the square look absolutely beautiful! It definitely looks worth a visit to spin those prayer wheels. When do you think would be the best time of year to visit? Technically, there is no real best time of the year to visit. The weather in Bhutan is mostly cold due to the country being in the Himalayas. But it does get much colder during winter, and may even snow. And that can be really lovely to see too, snow in the mountains, in the Himalayas. If you like high energy festivities, the best time to visit is during a Mask Festival. It is hard to know when these festival occur exactly because they change dates every year. The best would be to check with your travel agent or surf on the web for the festivities of that particular year. In time, I do plan to add a festivals section to this site. WOW! Bhutan looks impressive. Such a beautiful clock tower. Are there a lists of do’s or don’ts , tourists need to know when we visit Bhutan? Bhutan is impressive, Angeline. And it is as beautiful and magnificent as the photos. Thanks for dropping by. I will be adding more places to visit in Thimphu, Bhutan soon. Bhutan is basically a very nice place where the people are really nice. As with any country, there are some do’s and don’ts. I will be sharing those in a post in the future. But not worry, they are not really difficult to follow. Also, the people are tolerant of foreigners, and are understanding should you make a little mistake here and there. I’d like to visit Asia sometime, there’s just so much choice though. This place looks absolutely beautiful. Will have to check out your site more. This is such a peaceful and scenic place. always wanted to visit it, will have to plan forward for next year visitation. Thanks for sharing Tim. You’re welcome Kim! 🙂 It is truly the last Shangri-la on earth, Kim. Yes, you must visit before it becomes something else. I will be getting special offers on travels soon. Do come here to book your vacations in future. I love reading your posts about Bhutan! I think I’m going to make it my next visit after holidaying in Indonesia. Are the clock towers all hand made? I would love to go there at a time I could experience one of their ceremonies or festivals… I love experiencing different cultures and faiths…. Thank you so much for sharing Tim! Thanks Emrah for your kind compliments! Look out for more posts about Bhutan and other cities here. Most of the clock tower is hand made. Especially the art and decorations. If you like festivals, the Mask Festival is the best time to visit. Yes, we have plans of adding more info such as how to get there, transportation, festivals, etc. Thanks again Emrah. Please do sign up for our newsletters to get updates. Thank you for this article ! I read it with keen interest. Now I want to visit Bhutan ! And your photos are beautiful ! Did you take them all?